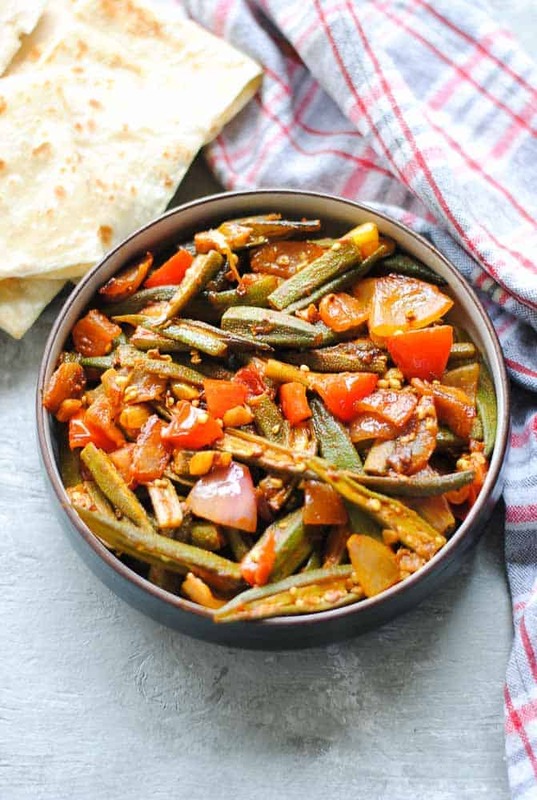 Bhindi fry is crunchy, green okra with roughly cut onions, tomatoes, garlic, spices and a dash of ketchup! Yum! Okra, quaintly called lady’s fingers in India, is a very popular vegetable there and there are SO many ways to make it. This is just one of them, and it gets ready in a heartbeat. Really, it’s that quick n easy! Hard to believe if you’ve never cooked it but all it takes is a few minutes to soften. Yes, you must get rid of the sticky goop that oozes out of okra when you cook it (also an indicator of its ‘doneness’), but that’s not rocket science. Just add a little mango powder and keep sautéing it on a medium to high flame. And the stickiness will disappear, bit by bit. The important thing to remember while cooking okra is never, never, EVER to add water. Not even a drop! You might be tempted to but trust me, it cooks perfectly well in a good non-stick pan. The minute you add water, the veggie disintegrates and the gooey substance is all over the place. So, whatever you do don’t add water. Make bhindi fry in a jiffy and have it with any Indian bread of your choice, preferably fresh rotis. Heat the oil and add the onions and garlic. Sauté for two minutes or until the onions are pinkish in colour. Add the tomato ketchup and powdered spices. Stir to mix with the ketchup. Add the okra and sauté for a few minutes. Put in the tomato, mix with the okra and turn off the heat (1 minute). The okra looks as if it will never soften when you begin to cook it, but the trick is to keep sautéing it. It will become sticky, but as you sauté it, the stickiness will disappear gradually. When it does, the okra is cooked. Do not add water at any stage as the okra will break down and the stickiness will never go away!